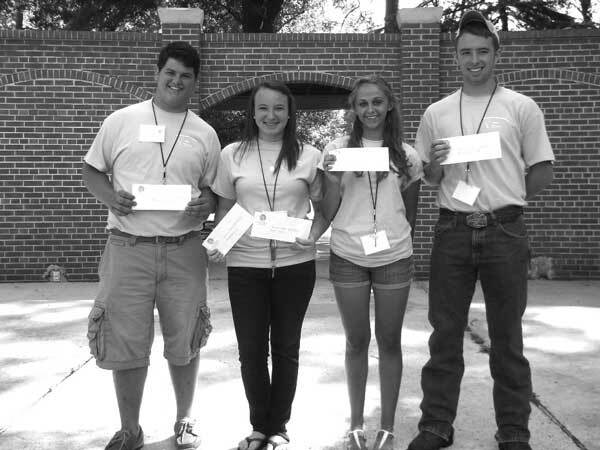 CUTLINE: (l-r) John Cuttino of Orangeburg, Lauren Babb of Marlboro, Rachel Sanders of Edgefield, and Kemp Wilson of Chester were named scholarship winners in the 2012 Conservation Workshop for Youth held on the campus of Lander University earlier this year. Sponsored by the SC Association of Conservation Districts, the SC Conservation Districts Foundation, and supported by Lander University, this is the 45th Annual Workshop. Congratulations to these students for their hard work during the week. The SC Association of Conservation District is pleased to announce the scholarship winners for the Conservation Workshop for Youth held during this past summer break. Students from across the state participated in the 45th annual Workshop at Lander University. Each student was sponsored by their local Soil and Water Conservation District and spent a week in studies that included soils, water quality, forest management, and conservation. A comprehensive examination was given on the closing day to determine scholarship winners for this year. The following students were scholarship recipients for 2012: John Cuttino of Orangeburg, Lauren Babb of Marlboro, Kemp Wilson of Chester, and Rachel Sanders of Edgefield. Lauren Babb of Marlboro took top honors for 2012 and was awarded the Covington-King Scholarship by Lander University. This four year renewable tuition scholarship is offered to a rising Senior who attends Lander to major in Environmental Science. The remaining scholarships are sponsored by the Orangeburg Conservation District, Fairfield Conservation District (Ruff Memorial Scholarship), the SC Chapter of the Soil and Water Conservation Society, and the SC Conservation Districts Foundation. Scholarships sponsored by Conservation Districts may be used at any institution of higher education.